The only Coconut Cake with Coconut Buttercream Frosting recipe you'll ever need. I have been obsessed with finding the perfect coconut cake recipe for over a year now. It all started when I went to a friends engagement party and they served one of the best coconut cakes I'd ever eaten and after admitting to the bride-to-be that I was on my third piece I've wanted to replicate it ever since. You'd think there are thousands of recipes for coconut cake out there online and in books but I found a lot of them are just a butter cake with some coconut sprinkled here and there or a plain butter cake with a teaspoon of extract added. That wouldn't do. I needed to find a recipe which would be the perfect coconut cake with an icing that had a hint of coconut but not too sweet and you could happily eat three pieces and still want more. With a whole lot of googling and frantic cookbook flipping through books I trusted I found a recipe I was happy with for the cake and a recipe I was happy with for the icing and BOOM! The perfect combination for cake and icing! It was moist (haha what a terrible word), had the perfect crumb and a great coconut flavour throughout the whole cake and then covered in dried coconut which looks like the cake was airbrushed with snow. It uses unsweetened coconut milk as the liquid and also unsweetened desiccated coconut that is soaked in boiling water to soften it so it didn't make the cake chewing that can sometimes happen when using dried coconut. The buttercream icing used coconut milk which evened out the sweetness from all the icing sugar and didn't overpower the flavour like some extracts can do. The baby bunting cake topper was also homemade, my bestie and I had a craft afternoon the day before and made it using 'Honestly Yum' DIY blog post and it worked perfectly. But most importantly the baby shower was lovely! We played a couple of guessing the bump and due date games, got to design a bib for the little mystery bub, drank a delicious champagne elderflower punch with fresh nectarine and cherries and ate sandwiches, cheese and cake. It was a perfect afternoon! The little one is due so so soon and I think we are all very excited to meet her/him when they arrive for the mum(& dad)-to-be as an early Christmas present. - Firstly, soak the desiccated coconut in boiling water for 15 minutes (or longer if you can) then pour into a sieve and press out the excess water. - Next grease and line 2 x 8inch round cake tins with baking paper and preheat oven to 350F/180C. - Using an electric mixer beat the butter and and caster sugar together until pale and creamy making sure you scrape the sides of the bowl down as you go. Beat in the eggs, one at a time until completely combined. If the mixture starts to look lumpy or split add 1 tablespoon of the flour and it should come back together. - In a separate bowl, mix together the flour, baking powder and salt. Sift half into the butter and sugar mixture and fold it in using a spatular then fold in the coconut milk followed by the remaining sifted flour and the drained desiccated coconut. - Divide the mixture into the two prepared cake tins and flattening and smoothing the tops. - Bake for 25 minutes or until the cakes have risen, are firm and slightly shrunken back from the sides of the tin. Leave to cool in tins for 10 minutes then take cakes out of tins and cool on wire racks completely. - Beat butter until pale and creamy using an electric mixer. Add in one third of the icing mixture and beat on high until combined and then add the next third and do the same until all the icing mixture in mixed in thoroughly, scraping the sides and bottom of your bowl as you go. - Add the coconut milk a table spoon at a time mixing really well after each addition. Once all the coconut milk has been incorporated beat on high for about 30 seconds to a minute. - Use immediately or store in an airtight container in the fridge for 3-4 days then bring back to room temp and beat on high for 2min. - Make sure your cake is completely cooled and the icing is smooth and fluffy. - Even out the two cake layers by thinly slicing the tops of them off using a serrated knife. - Put a splodge of icing down on your serving plate and place a layer of cake down onto the splodge of icing. This icing is to hold the cake to the serving plate so it wont slide around so make sure your cake is also centred because you wont be able to move it around after this point. - Next, spread about 1 cup of icing onto the centre of the cake evenly then place the other piece of cake, cut side down on top of the icing. Spread a thin layer of icing all over the cake - top and sides using a pallet knife and fill in any gaps you might have then place in the fridge for about 15-20 minutes. Once it comes out of the fridge, spread a thick layer of icing all over the cake as evenly as possible and place it back int he fridge for about 10 minutes - no longer! - To get the coconut around the whole cake press very very lightly desiccated coconut to the sides of the cake with your hand making sure you have a large tray underneath to catch the excess and sprinkle the top generously. Be careful not to press hard as you'll put your finger through the cake. Place in the fridge until ready to serve then take out about 1 hour before serving. I've become lazy and blank on this space. We all have those days where everything you make/eat tastes meh...well I do. So my reason for silence and blank-ness is that everything I make lately is meh and there are thousands of food blogs out there with flashier photo's and a much broader recipe base, not just about what I made (& ate) for dinner which lately has been meh for you to read and drool over. Saying I feel lost in cyber space is an understatement. The last tasty thing I made was a couple weeks months ago now and I still can't stop thinking about it. Pomodori al riso aka Tomatoes stuffed with rice from 'Five Quarters: Recipes and Notes from a Kitchen in Rome' by Rachel Roddy who writes the blog Rachel Eats. I have a thing for stuffed vegetables... stuffed anything really. If you can fill it and bake it, why not!? isn't everything better when its stuffed and baked? You don't see recipes that double carb it much these days with all the 'super foods' and 'clean eating' shenanigans around but it was nice to read a recipe that was just honest home cooked food. Nothing there to convince me what health benefits it would have on me other than to fill an empty tummy and serve to friends with a nice side salad and a good bottle of wine. I mean the first ingredient is 8 firm, fruity, fleshy and flavoursome tomatoes... how can you not want to make this instantly?? With a little bit of prep and planning, once it is all assembled and ready to go in the oven you can forget about for 1-1 1/4 hours and then once the timer goes off you have another 30 minutes to fix your hair (also so the tomatoes, which are pyroclastic-ly hot don't burn the roof of your mouth) before you serve a dinner that looks impressive and isn't shy on flavour. The recipe says you can leave them until they are at room temperature as it allows the flavours to settle and get better but I'll be completely honest with you, I only left mine long enough so I didn't singe my mouth off because as always... hunger wins! Next time I'll wait though, all the little grains of rice soak up the olive oil and tomato juice and have time to mingle with the basil. I had leftovers for lunch the next day and it was perfect! I love how this meal is honest home cooking that doesn't skimp of taste. No flashy ingredients or techniques, just a damn delicious dinner. I make again and again over summer, just have to wait for the big juicy tomatoes to come into season... bring on summer! - Preheat your oven to 180C/400F. - Cut the tops of the tomatoes, keeping the little lids aside and one by one hold each tomato over a bowl and, using a teaspoon, scoop out their insides - flesh, seeds and juice - into the bowl. Sprinkle a little salt in the inside of each tomato then turn cut side down onto paper towels, set aside. - Process the tomato flesh, seeds and juice in a food processor or blitz with a hand blender. Add the garlic, basil leaves, rice and olive oil to the pulverised tomato flesh, season generously with salt and pepper. Stir everything together well and then let sit for at least 45 minutes so the rice soaks up all the juices. - Meanwhile, cut the potatoes into 1cm thick, 3cm long matchsticks. Place them in large baking dish, pour over a little love oil, sprinkle with salt and using your hand toss the potatoes until they are well coated. Spread them out evenly on your baking dish and place the hollowed out tomatoes in amongst them. - Spoon your rice mixture into the hollow tomatoes until they are 3/4 full then place the lids on top. 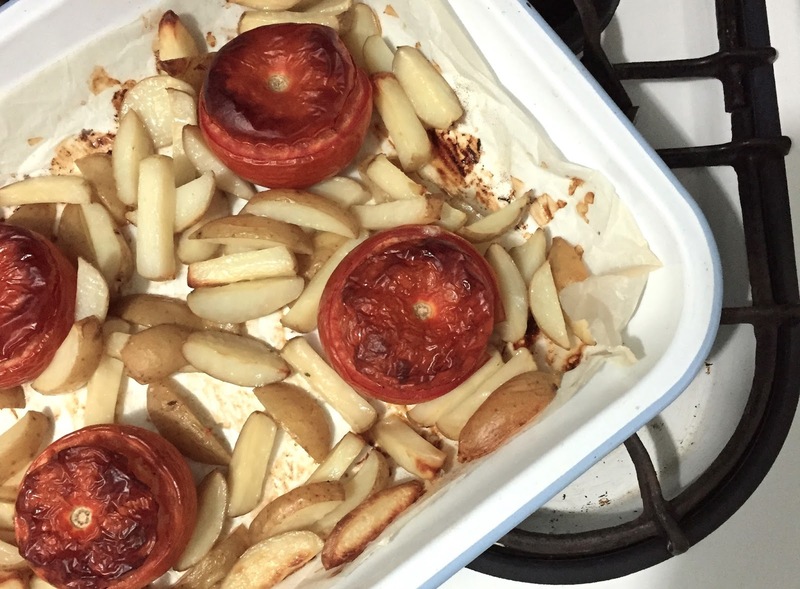 Slide the tray into your pre-heated oven and bake for 1-1 1/4 hours, or until the tomatoes are soft and just starting to shrivel, the rice is plump and tender and the potatoes are soft and golden. Allow them to sit for about half an hour before eating. Warning - the tomatoes are blistering hot when they come out of the oven (no joke!) so I advise you don't skip the last step and let them sit and cool down slightly before digging in.